After nearly six years of filming, The Walking Dead crew has really settled into its adoptive home of Senoia, the small Georgia town that’s stood in for the fictional Woodbury and Alexandria Safe Zone. Norman Reedus, who plays Daryl Dixon on the show, has even purchased a house in the area. 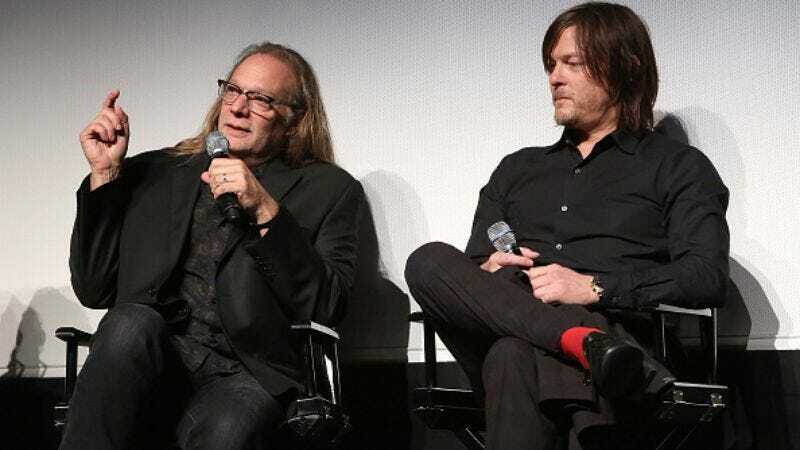 And now Reedus has teamed up with TWD director and producer Greg Nicotero to add something other than Karo syrup blood to the local flavor: Entertainment Weekly reports they’re opening a new restaurant in Senoia this summer. The name of the restaurant is Nic & Norman’s, and Reedus shared a photo of the restaurant’s logo, which has a paintbrush to represent Nicotero, who’s also the special make-up effects supervisor on TWD, while the arrow is a nod to Reedus’ character on the show. That’s presumably as far as the Walking Dead references will go since Robert Kirkman is no fan of restaurateurs trading on the name of his popular comic and TV series. Then again, the menu hasn’t been shared yet, so it could very well feature a Bob’s burger, or maybe some of Carol’s cookies. Nic & Norman’s doesn’t have an official opening date yet either, but it is expected to be up and running by July 11.